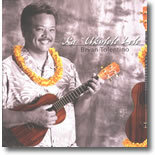 Comments: Ka `Ukulele Lele is a mixture of Hawaiian, contemporary and original songs. It is a wonderful blend of Bryan's creativity and diversity with the `ukulele. He is a self taught `ukulele player who began playing the `ukulele at the tender age of 10. A wise friend Karen Keawehawai`i shares,"Ka `Ukulele Lele" will brighten your day and only prove to enhance your musical library to date."